Some rain beginning of September, with beautiful conditions until the end of the harvest. Château de Beaucastel has long been considered as one of the greatest wines in France. It is notoriously known for its elegance, balance and ageing potential. Beaucastel has an exceptional Terroir at the Northern limit of the Appellation of Châteauneuf du Pape, exposed to the Mistral wind. All thirteen varieties of the Appellation have been grown organically since the sixties. Each variety is harvested manually and separately. Vinification takes place in oak fermenters for the reductive varieties (Mourvèdre, Syrah) and in traditional enamelled concrete tanks for the Oxydative grapes (all the others). Once the malolactic fermentation is finished, the Perrin family blends the different varieties. The blend is then aged in oak Foudres for a year before bottling. Steady ruby colour with light red overtones. Intense nose of blond tobacco, macerated fruit with tones of old tanned leather. The mouth is round and dense and well balanced with a lively finish. A nice expression with still a lot of potential. Around 15°C. If possible, decant the wine. A very beautiful expression of this vintage. Its forest floor and smoky notes, its deep and very spicy finish, coated with much sweetness make this wine one to wait for. Much more like the 1990 than like the 1989. Redolent of meat and undergrowth and leather though there is also a hint of something floral, possibly lavender. Herbal and gamey and definite smoky bacon character. Lacks the grace and elegance of 1989. A medium ruby color in the glass, with very little brick or orange highlighting to betray its age, this wine has a nose of bacon fat, raspberry, mud, and the mix of Provencal herbs that the French call garrigue. There is also a savory umami character to the aromas of the wine, which with more air add a soy note to the overall composition. In the mouth the wine is perfectly balanced with an acidity that makes it pop in the mouth with juicy flavors of raspberry and redcurrant fruit. The wine has gorgeous texture and a light tannic structure which supports deeper more resonant elements of flavor that lean towards the herbal and ever-so-slightly leathery side. The finish simply goes on forever, and like most wines of this caliber, both compels awestruck contemplation as well as immediate additional consumption. Phenomenal. The 1988 Beaucastel has evolved from a surprisingly forward, supple style, to one that is now revealing more tannin and structure. Nevertheless, the wine already has accessibility and charm. It exhibits a healthy dark ruby/purple color with no signs of age. Medium to full-bodied, with plenty of earthy, sweet, ripe fruit, a dosage of brett (a sweaty horse/old leather scent), and a long, rich, concentrated, moderately tannic finish. The wine will evolve for another 12-15 years and last even longer. Elegant and understated, with lovely fruit and structure. Has an excellent deep color, with focused black cherry and refined spice aromas, a full body of refined tannins and spice and berry flavors. 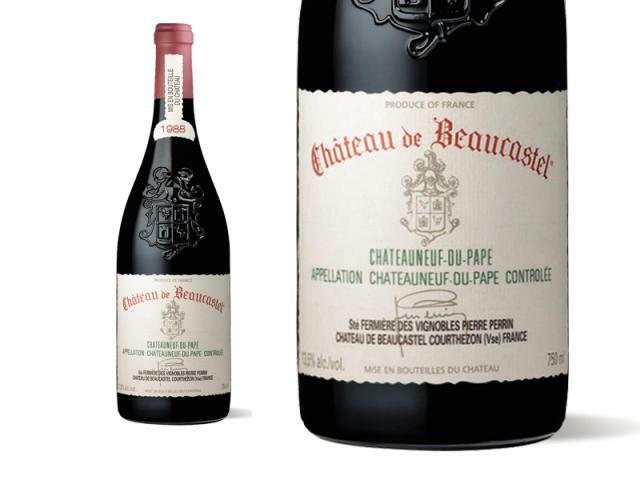 Needs time to develop.--Châteauneuf-du-Pape retrospective. Best from 1993 through 1995.